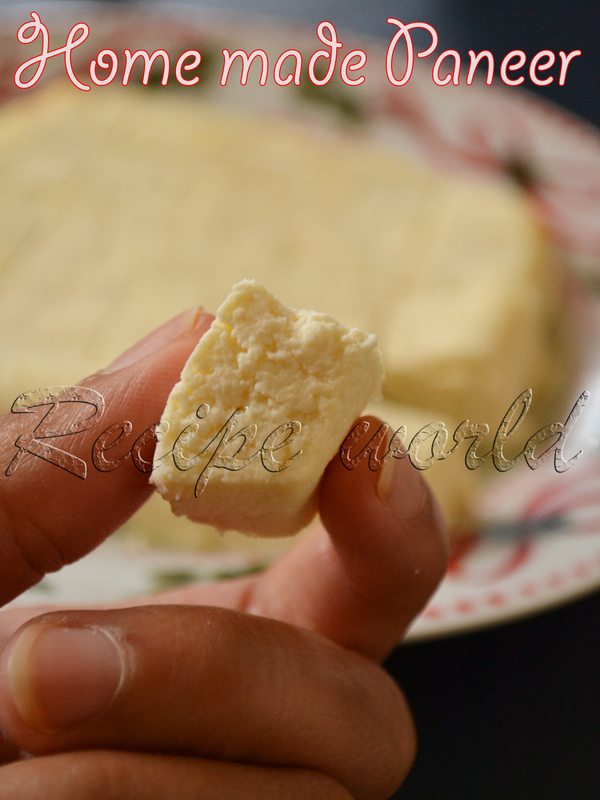 Paneer or Cottage Cheese is a common ingredient in most of the North Indian side dishes. Also, there are varieties of sweets which calls for Paneer as the primary ingredient. 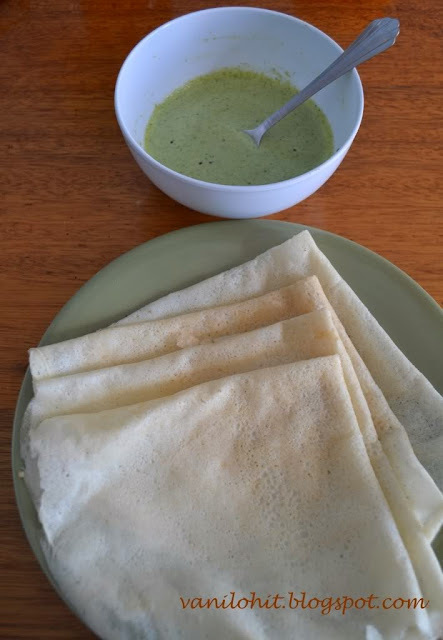 Since Paneer is easily available in super markets and convenience stores, most of the people prefer to buy them instead of preparing it at home. If you have enough time, preparing Paneer at home is not a big deal. 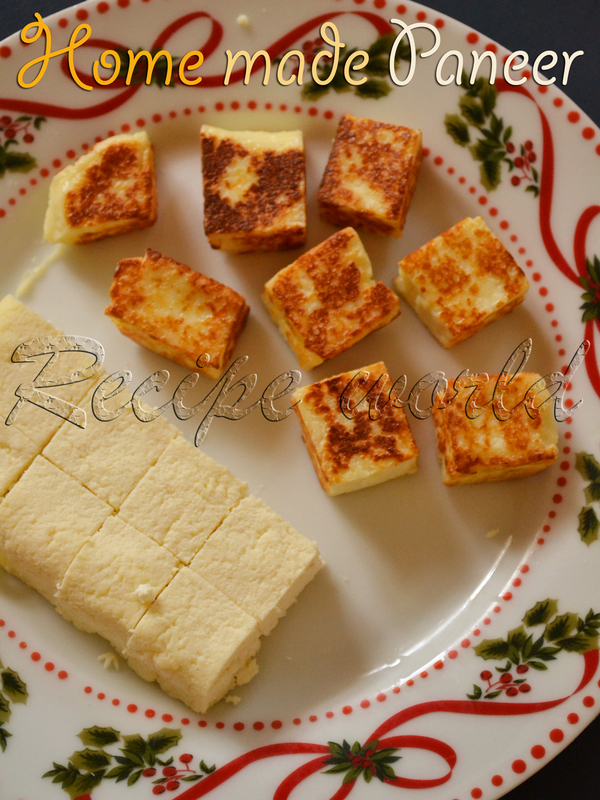 Here is the recipe of Home - made Paneer..
Heat the milk in a vessel and bring to boil. Once it starts boiling, add 1 table spoon of lime juice and stir it nicely. Keep it on medium flame and stir regularly. After 1 - 2 minutes, add one more spoon of lime juice. You can see the milk starts curdling slowly. Add little more lime juice if required. Keep stirring the mixture regularly. After boiling it for 15 - 20 minutes, all the fat separates and the water turns into pale green color. Switch off the flame and pour the mixture onto the muslin cloth. Expose the mixture to tap water once, to remove the citrus content. Tie the paneer mixture inside the cloth and hang it onto a hook or tap for 1 1/2 hours. Then, spread the paneer mixture on a flat surface and knead it nicely without any lumps. Pat it into a square or rectangular shape and keep refrigerated for 30 minutes. 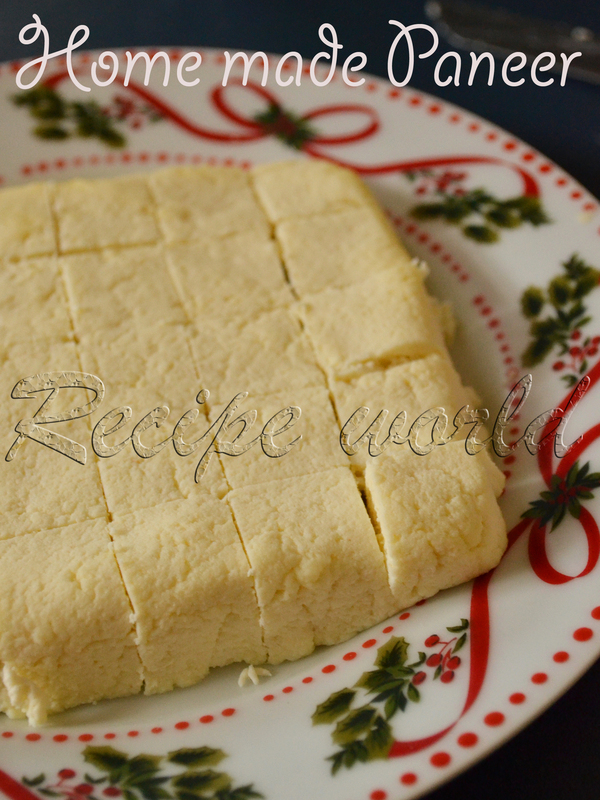 Take out the paneer and cut into desired shapes. While adding paneer cubes to any side dishes, shallow fry them on the tava to avoid them from breaking. Dont discard the water which you get while preparing the paneer. This water, known as Paneer Ka Pani is good for health. You can replace the plain water for side dishes with Paneer Ka Pani. Don't know whether I am becoming more busy (or lazy!) these days, its becoming tough for me to invest time for blogging. We were roaming around different places during the week-ends and kiddo keeps me busy during the week days! Even I tried varieties of dishes, but couldn't click the picks being with her. We had a memorable Diwali celebration this time. There are more Indians in our locality. So, we took part in Diwali celebrations at different places. We celebrated the festival at home one day. I had prepared Holige / Obbattu for Diwali this time. In fact I prepared Seven Cup Burfi and Mysore Pak too! But they were for kiddos playgroup and hubby's office. 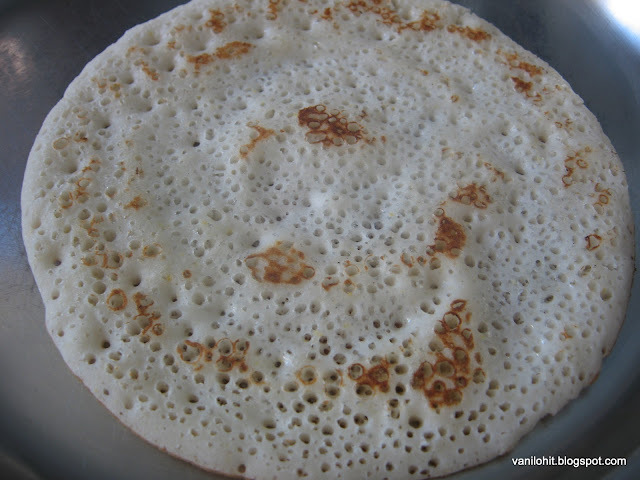 There are different ways to prepare this Tovve. My version was slightly different earlier; after I learned this version from my friend Maitri, I just shifted to this method. 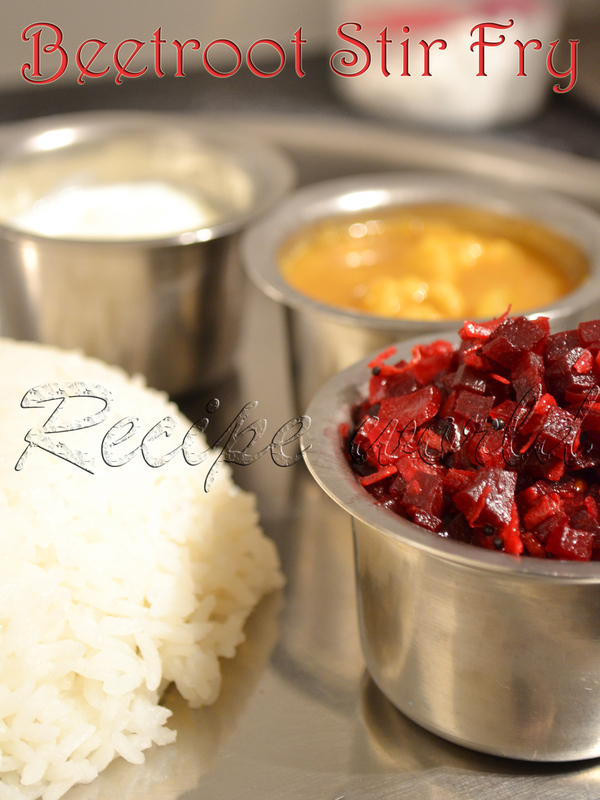 Try this simple and easy curry and let me know your feedback! 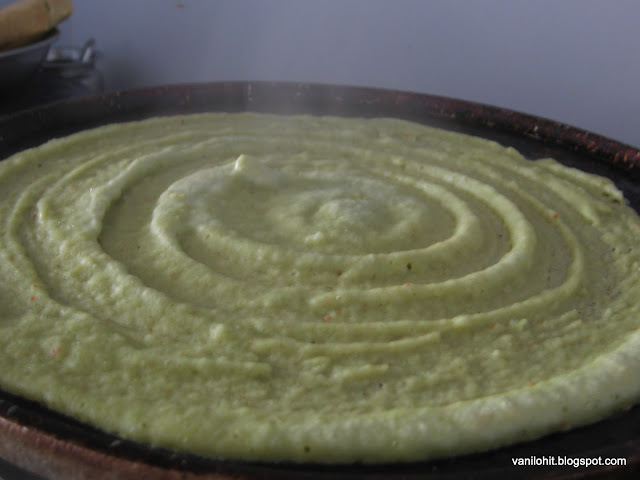 Wash the moong dal in clean water. To this, add around 3 cups of water, big pinch of turmeric and 2 - 3 drops of cooking oil. Pressure cook for 1 whistle. You can cook it directly on the stove top; it takes little longer to cook. 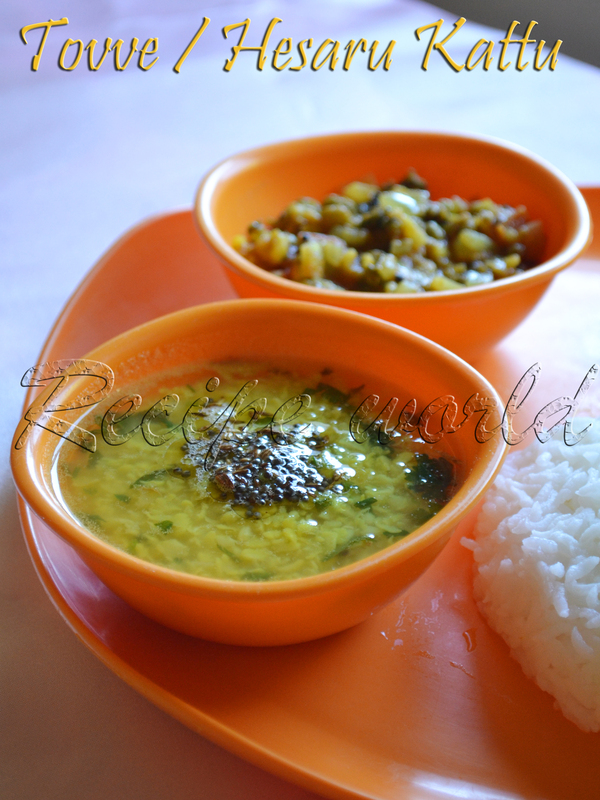 Once the moong dal is 3/4th cooked, add crushed ginger, slit green chillies, hing, salt and lime squeeze for taste. Add little more water if required. Let it boil nicely for 5 minutes and then, add the chopped coriander and turn off the flame. Heat ghee in a small wok. Add mustard seeds and cumin seeds. 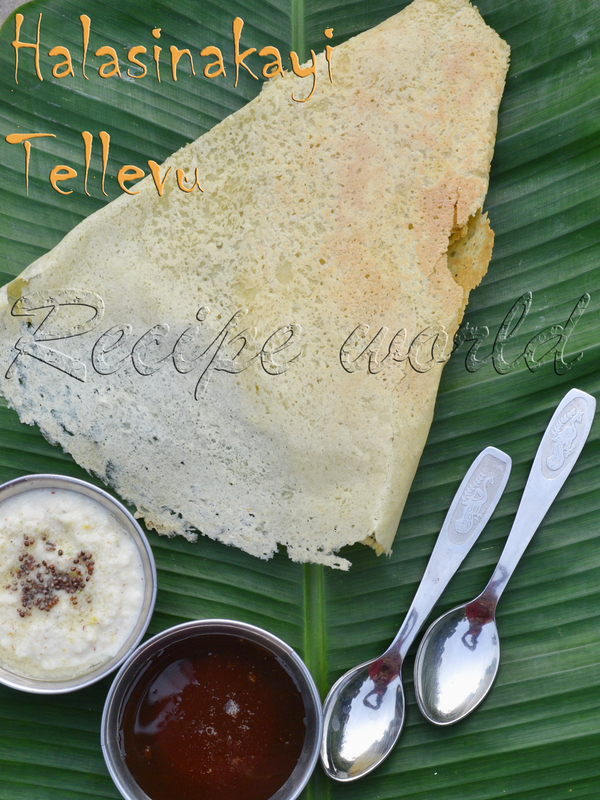 Once it starts crackling, mix it with the prepared Tovve or Dal mixture. Serve it hot with rice and pickle! Lime squeeze can be added either before boiling the mixture or at the end. Anything is fine! 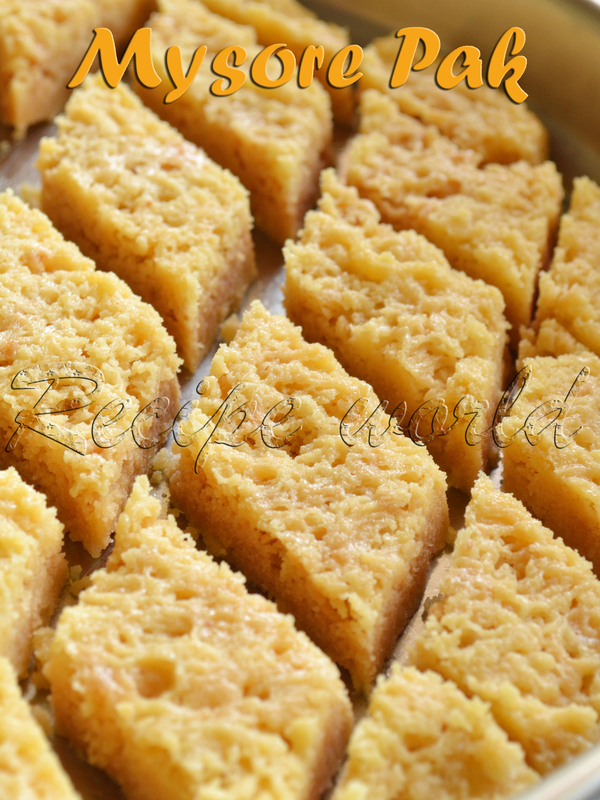 Mysore Pak is one among those famous Indian sweets which are prepared during festivals and special occasions. 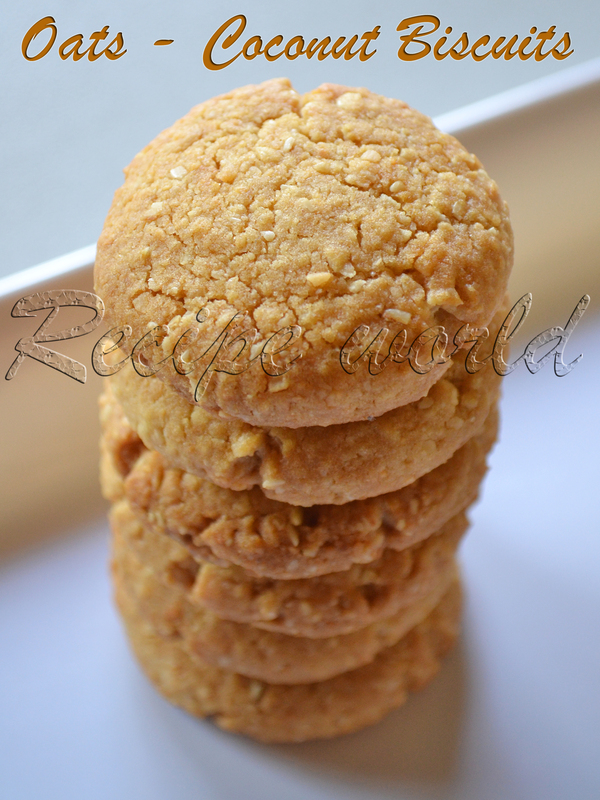 With the nice aroma and flavor of ghee, this sweet tastes divine and just melts in your mouth! 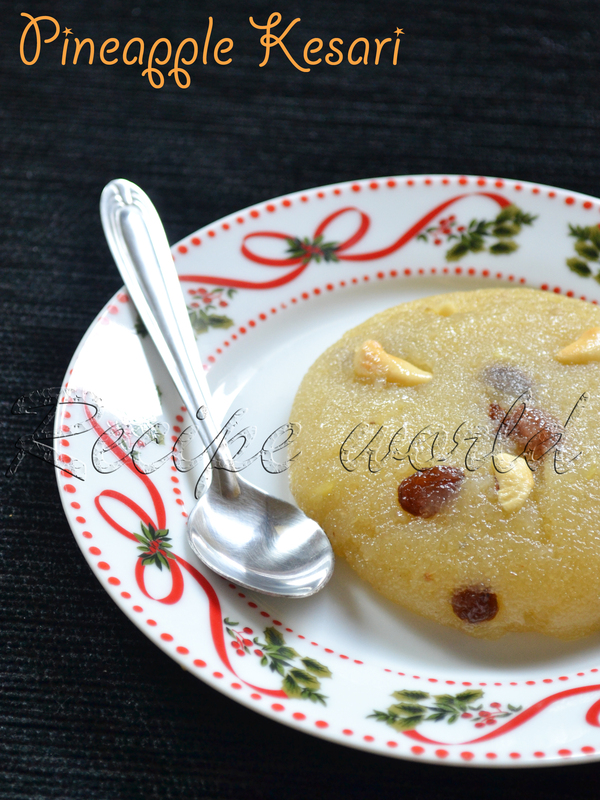 Mysore Pak is my favorite sweet ever and of course, this is the first sweet recipe I learnt! My Aunt is an expert in preparing Mysore Pak. She uses fresh home made ghee for preparing this sweet and everybody at home loves to have this delicious sweet. Preparing Mysore Pak is not that difficult, but experience makes you perfect! You need to know the right time and consistency to take out the mixture from the flame. 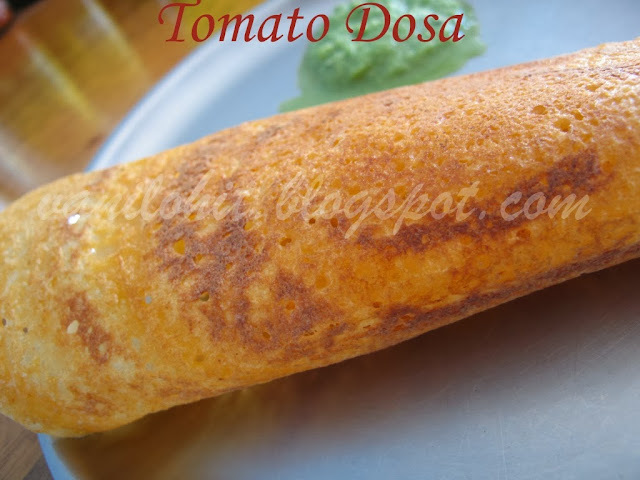 And freshness of the ingredients i.e., ghee and gram flour / besan flour also matters a lot. Mysore Pak can be prepared using Dalda/Vanaspati or other oils also, instead of ghee. I prefer using half - ghee and half - sunflower oil. 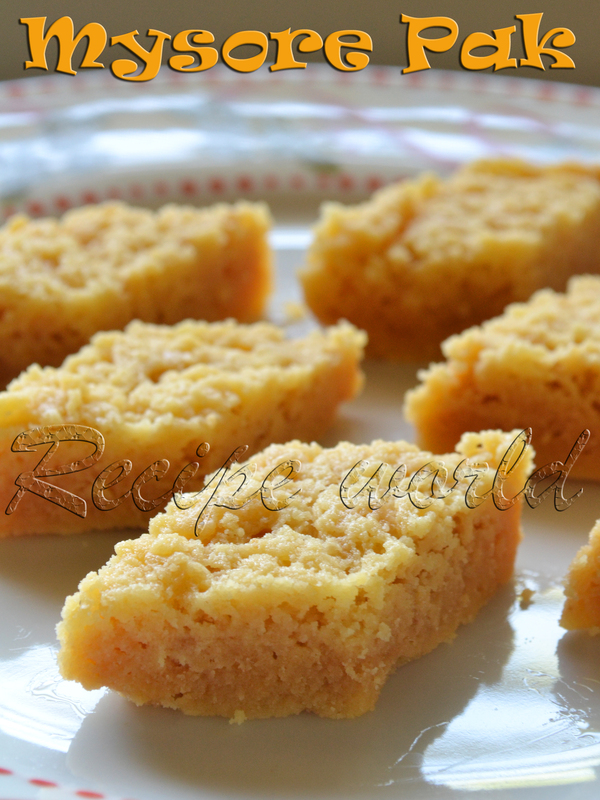 Try this Mysore Pak recipe at your home and let me know your feedback! Combine sugar and water and bring to boil. By the time it reaches two string consistency, we need to roast the besan flour. 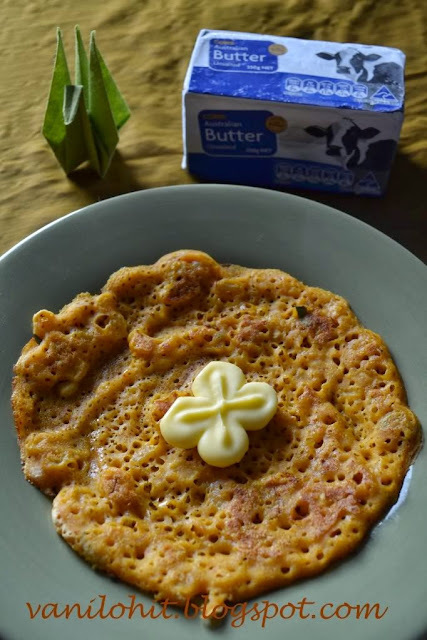 Take 1/2 cup of ghee in a wide pan. Add besan flour and roast it on low flame till nice aroma comes. Add a pinch of salt once its done. Heat the oil and the remaining ghee separately and keep ready. 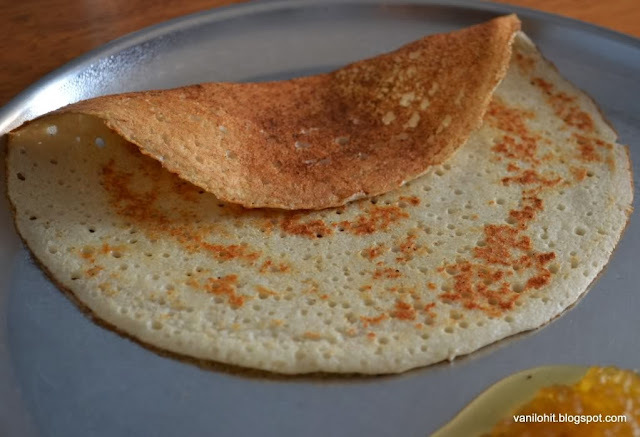 Once the sugar syrup reaches 2 string consistency, add it to the roasted besan flour and mix well. Keep mixing it continuously on medium flame. Add 2 - 3 table spoons of oil at a time to the flour mixture. Once the oil is absorbed in the mixture, add 2 - 3 tbsp of oil again. Repeat it till all the oil gets over. Then repeat the same thing with ghee. At one stage, the mixture starts leaving the oil from the sides or bubbles start coming up and the mixture starts leaving the ladle. Quickly add a pinch of cooking soda, mix it nicely and turn off the flame. Pour the mixture onto a wide plate and allow to set down. 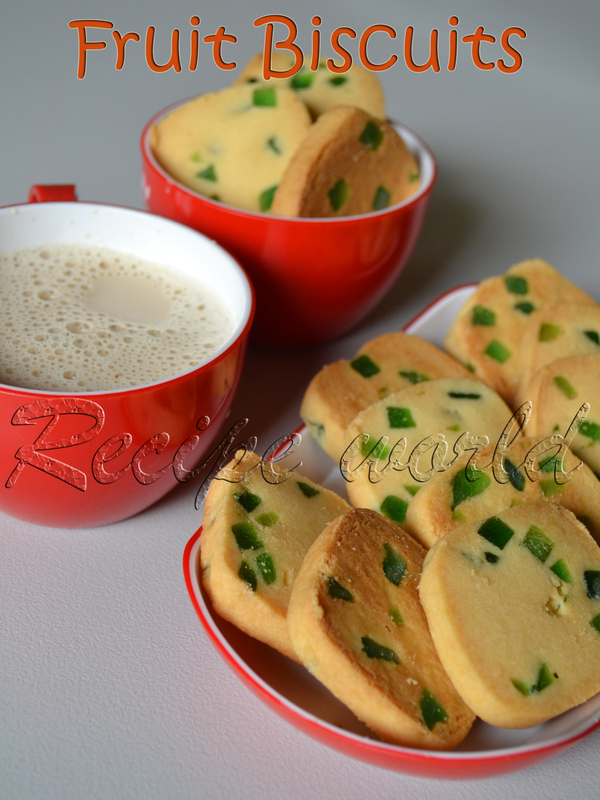 After 3 - 4 minutes when the mixture becomes slightly hard, cut it into desired shapes using a knife. Allow it to cool completely. Separate the pieces after its completely cool. 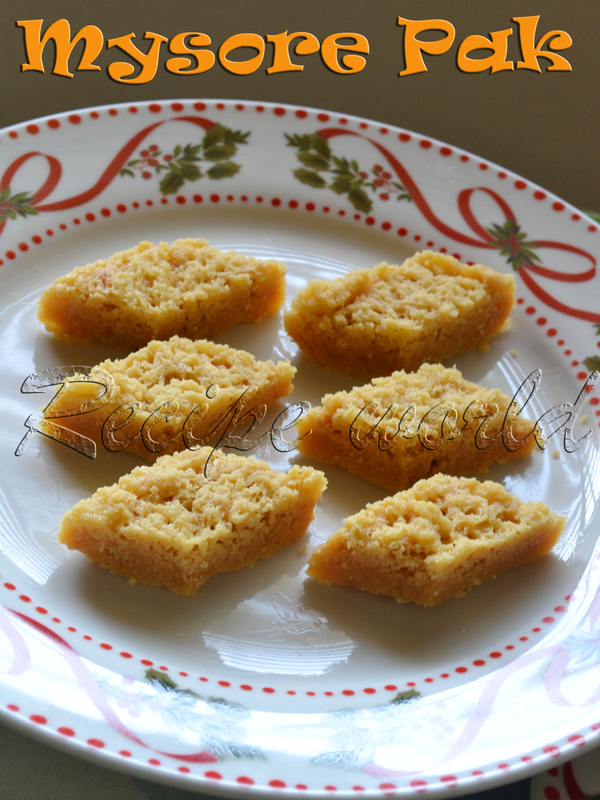 Enjoy the home made Mysore Pak with your family! If you wont like to use any oil, can use 2 cups of ghee instead. If the quality of besan flour is not good, you may not be able to get the perfect Mysore Pak sometimes. 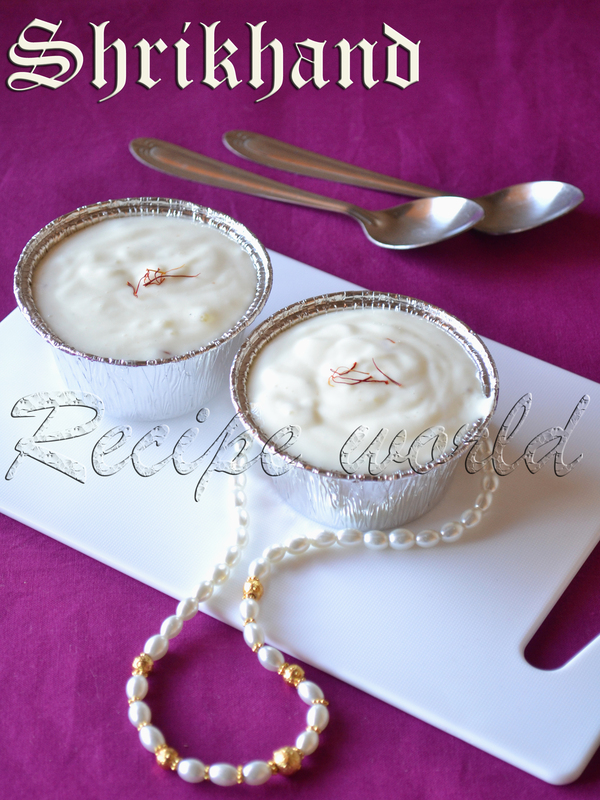 Make sure that the ghee and oil will be slightly hot while preparing this sweet. It will give a nice crispy texture to the Mysore Pak. After coming back from work, having a cup of hot tea blended with spices is my Hubby's daily routine. We all would like to have some snacks along with evening tea, with lot of talk and laughter since it is the relaxing time for us! Me and Hubby prefer home made snacks all the time and so, I maintain at least 2 - 3 varieties of snacks in my pantry most of the time. Just like every other kid, my daughter also loves the store bought biscuits and snacks. So, we buy her favorite snacks sometimes from the stores. 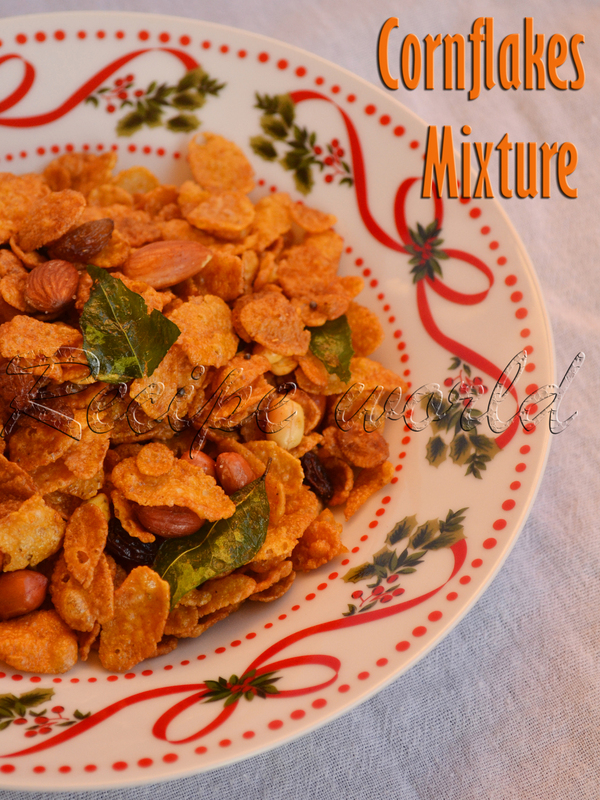 Cornflakes Mixture is one of the tea time snacks which I prepare. We do buy plain cornflakes to make breakfast on lazy days, but most of the time I will use it for making the Mixture. 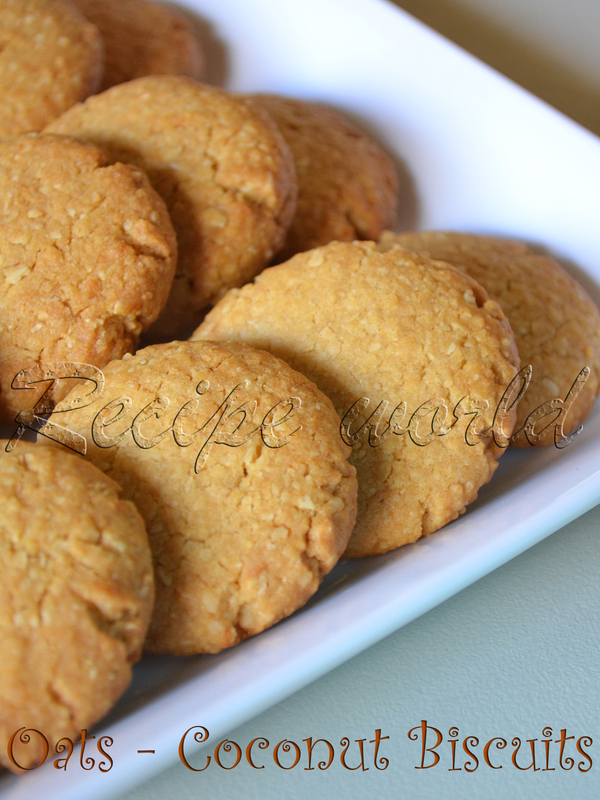 This mixture is easy to make and goes well with your cuppa tea! Cornflakes can be used directly if its crispy. Else, you need to toast them on low flame or oven - roast them for few minutes till it becomes crispy. Heat oil in a heavy bottom pan. Add almonds and ground nuts and saute for 2 - 3 minutes. Add the broken cashews and saute for a minute. Then add raisins, split dalia, urid dal and mustard seeds. Once the mustard seeds start crackling, add turmeric powder. Saute them till raisins puff up. Then add curry leaves and saute for a minute. Add the Masala Powder and turn off the flame. Add salt and sugar powder for taste. Fold in the cornflakes and mix everything nicely. Check and adjust the taste, it required. Transfer the Mixture onto an air tight container and use as required. 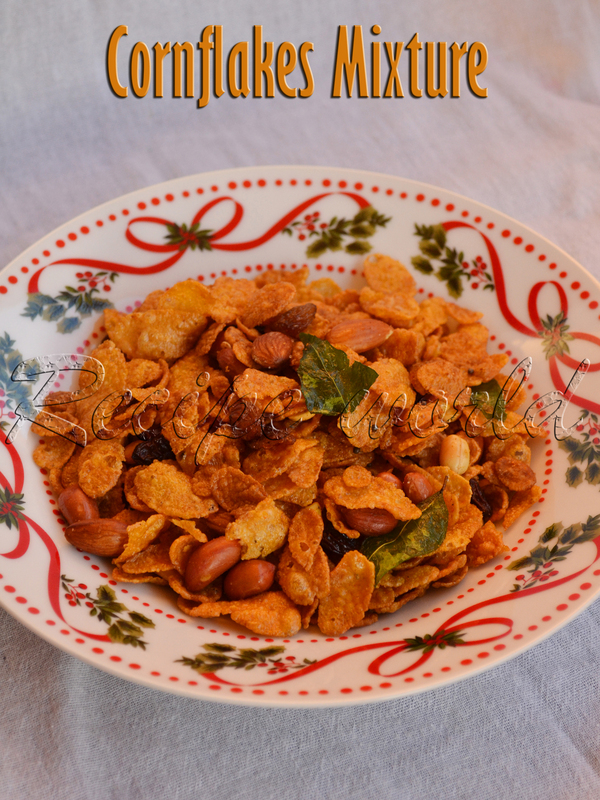 Cornflakes mixture is a perfect snack for tea time. This mixture goes well with Rava Upma and Seasoned Poha too! Blueberries are one of among the Baker's favorite fruits. As the name indicates, these pretty fruits are blue in color and have a sweet and a bit sour taste. I had eaten fresh blueberries quite a few times, but never used them in baking. Last month, we bought the frozen ones to prepare smoothie and I thought of preparing Blueberry Muffins for the kiddo with the leftover fruits. Whenever I plan to bake something, I need to think of the egg substitute first, since we wont eat eggs. This time, I decided to use milk to prepare my muffins. Experiment went on well and the muffins tasted good. But I felt like some more improvement is needed. Next time, I replaced milk with curd in the same recipe and yippee..muffins came out perfect! I have tried this recipe several times and yes! 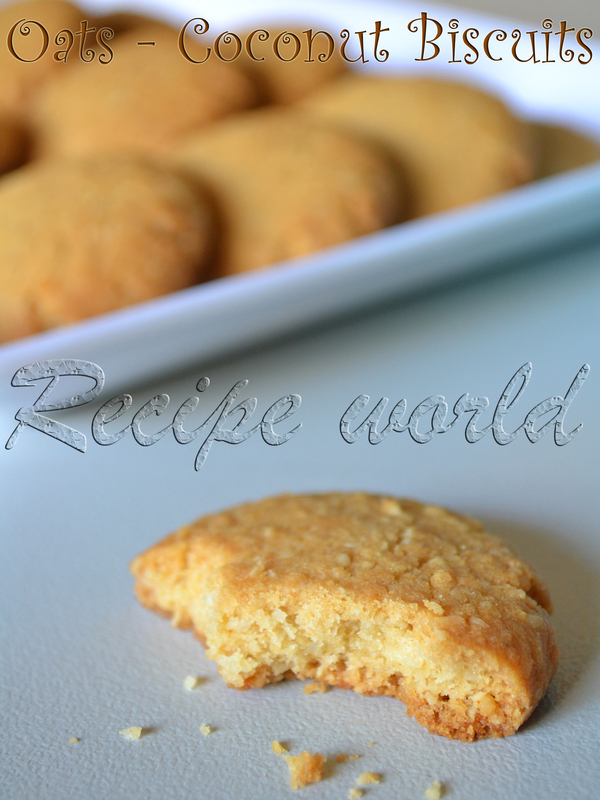 now its the time to share the recipe with you all!! 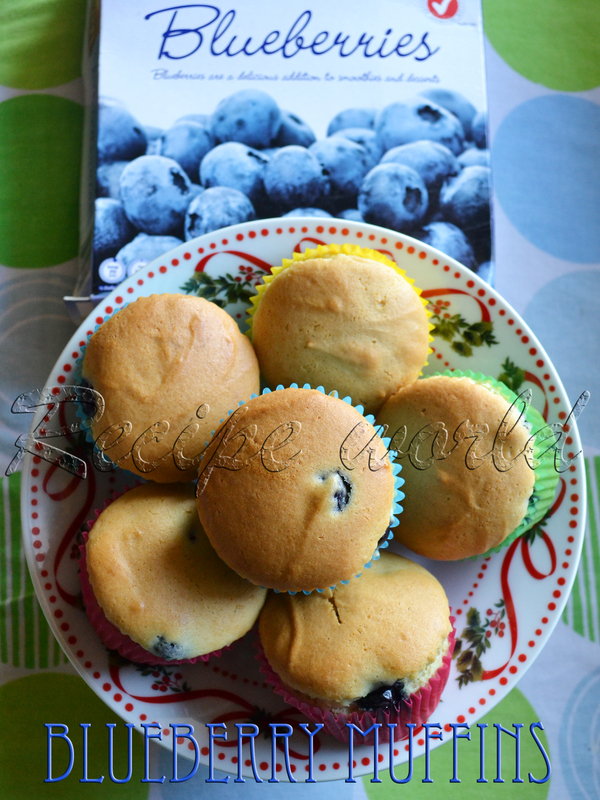 Here is the recipe of Egg less Blueberry Muffins..
Sieve all purpose flour 2 - 3 times and keep aside. Combine curd and sugar in a mixing bowl and dissolve the sugar completely. To this, add baking powder, baking soda and mix it slowly. Leave it for 2 - 3 minutes to rise. 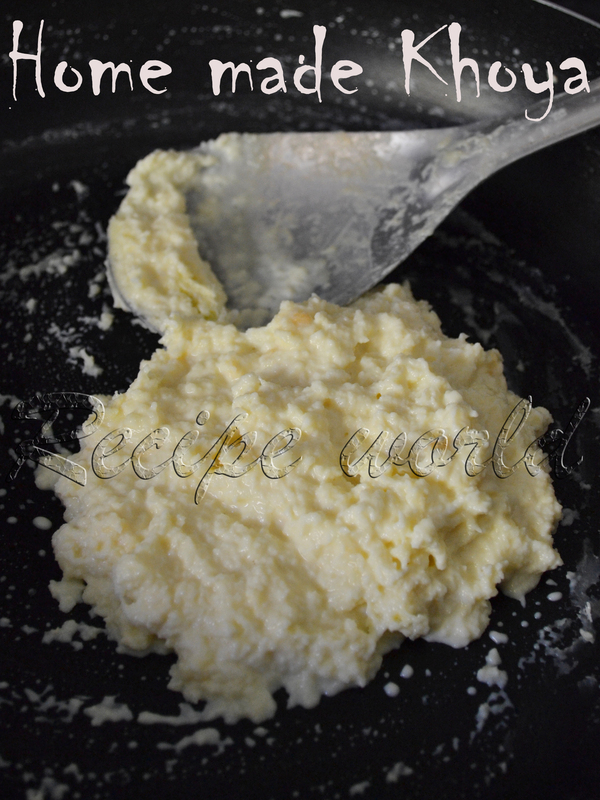 Add oil, pinch of salt and vanilla essence to the curd mixture and mix it lightly. Fold in the all purpose flour in small batches and mix it slowly without lumps. This batter will be thicker than the regular cake batter. If you find it too hard to mix, you can add 1 - 2 spoon of milk. For me, it was fine and I didn't add any milk. Finally add the blueberries to the muffin batter and mix it well. Fill the batter in lined muffin cups up to 3/4th level and leave some space for them to rise. This batter would be sufficient to make 6 medium sized muffins. Keep the muffin tray inside the oven and bake for 23 - 25 minutes or till done. Check the muffins after baking for 20 minutes. If the toothpick or knife inserted comes out clean, its the indication that the muffins are done. Take out the muffins and keep them on a cooling rack. 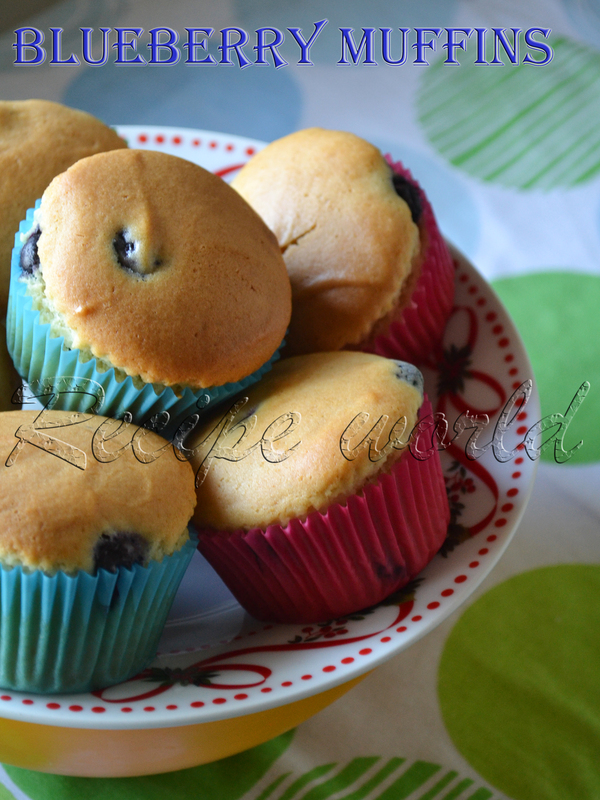 Enjoy the home made Egg less Blueberry Muffins with your family! I have used frozen blueberries here; fresh blueberries also goes well for this recipe. Don't add more blueberries than mentioned above. Once I had added 3/4th cup of blueberries instead of 1/2 cup. It was too moist and the texture was not to good. Ash gourd, also known as winter melon or white pumpkin, is used for preparing various dishes in Indian cuisine. Apart from regular dishes like Sambar, Majjige Huli, Palya and so on, delicious sweets like Petha and Halwa can also be prepared with this vegetable. Ash gourd is a good source of various nutrients like iron and calcium. Due to its nutritional facts, I love to use it in my cooking frequently. 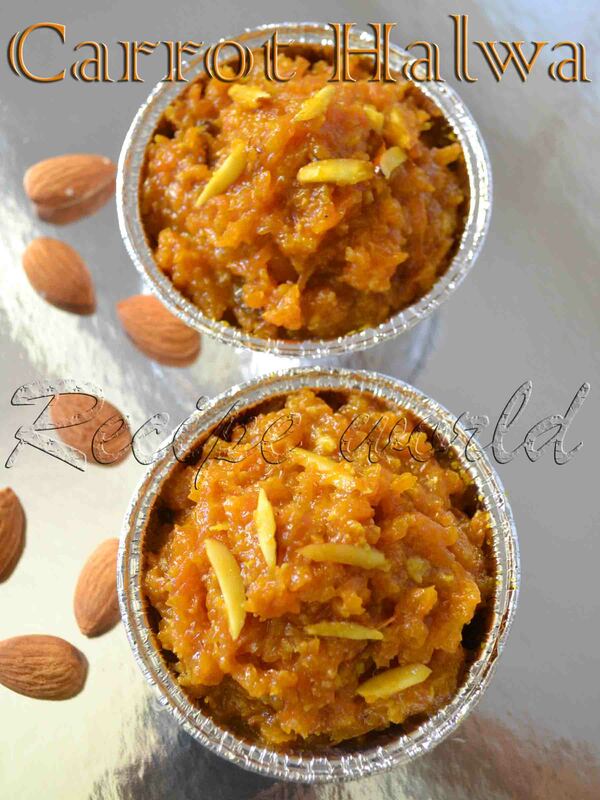 Kashi Halwa is a well known sweet dish prepared using Ash Gourd. 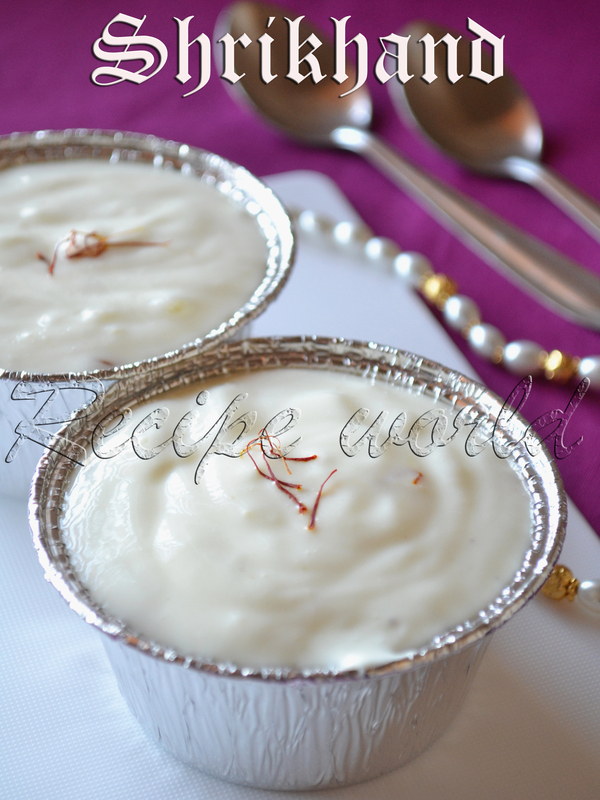 Its a traditional sweet in Indian cuisine, I had tried it this time with slight variation. It was delicious and my family liked this sweet. 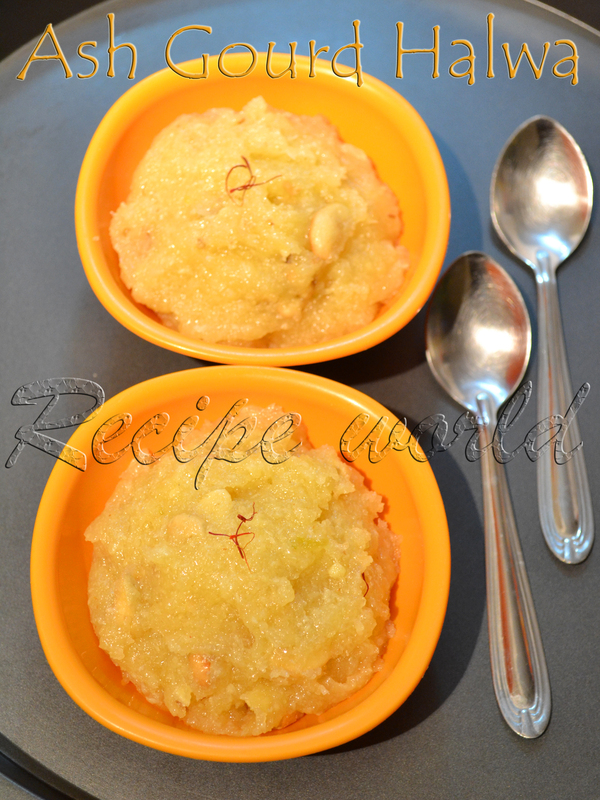 I am sharing the recipe of Kashi Hawa / Ash Gourd Halwa here..try it and enjoy with your family! Pressure cook the ash gourd for 2 whistles on medium flame. Melt the ghee in a heavy bottom pan. 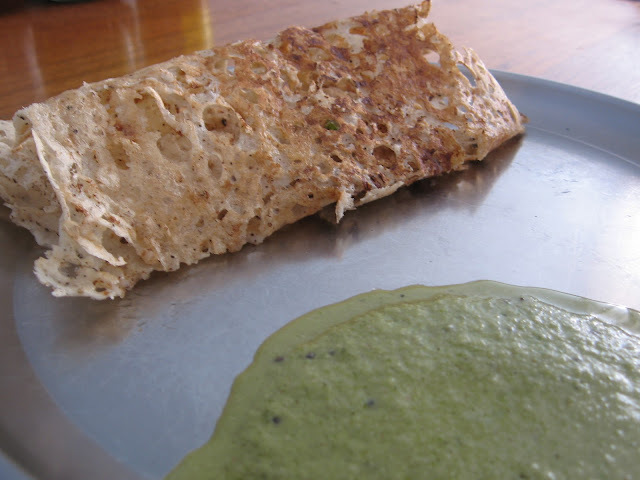 Fold in the chiroti rava and roast it till aromatic. 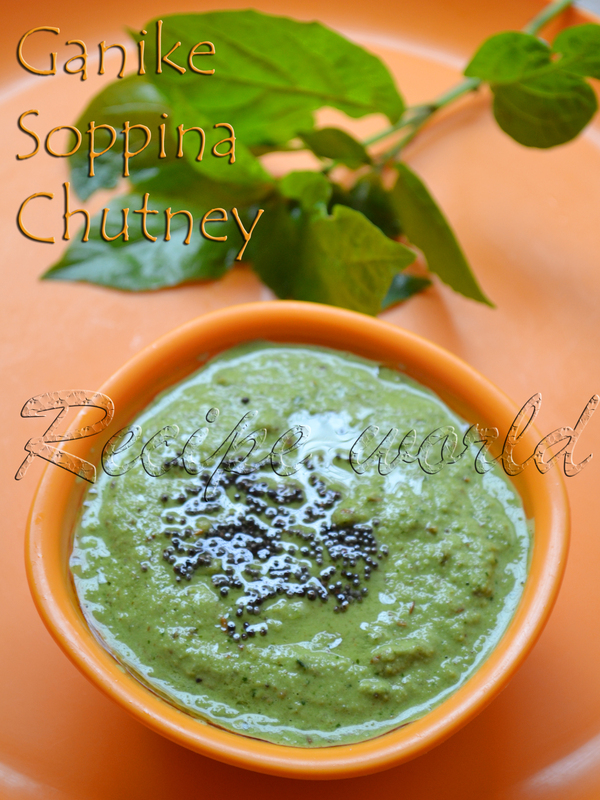 To this, add the cooked ash gourd and saute it for 2 - 3 minutes. Add sugar, saffron strands, pinch of salt to the mixture. Cook it on low flame till it becomes thick. Add Khova and cook it for 5 more minutes and switch off the flame and add the cardamom powder. Roast the cashew pieces in 1 tsp ghee till golden brown and mix it with Halwa. 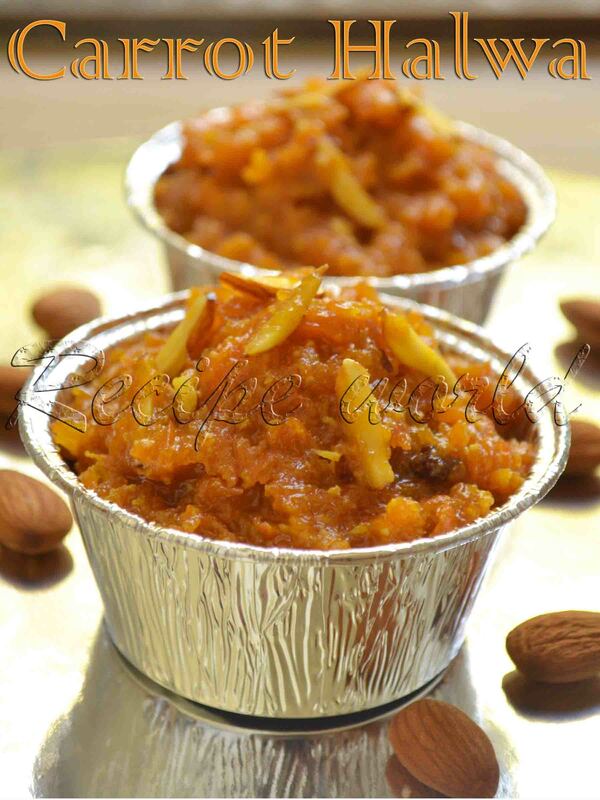 Thats all, delicious Halwa is ready to serve! At many rural places like my native, various fruits and vegetables are grown in their own estate. Rarely they buy veggies from the markets. Home grown vegetables are always healthy, tasty and are free from harmful chemicals and pesticides. Here in Australia, we will grow few veggies like fenugreek leaves, tomato, chillies, etc. in our balcony garden. I love to use various leafy vegetables in my cooking. Few days back, we had got a big bunch of drumstick leaves from the grocery store. I remembered my Mom's way of preparing the Stir Fry and tried the same. It was so tasty and I prepared it one more time! Some recipes like this are always a hit at my home. 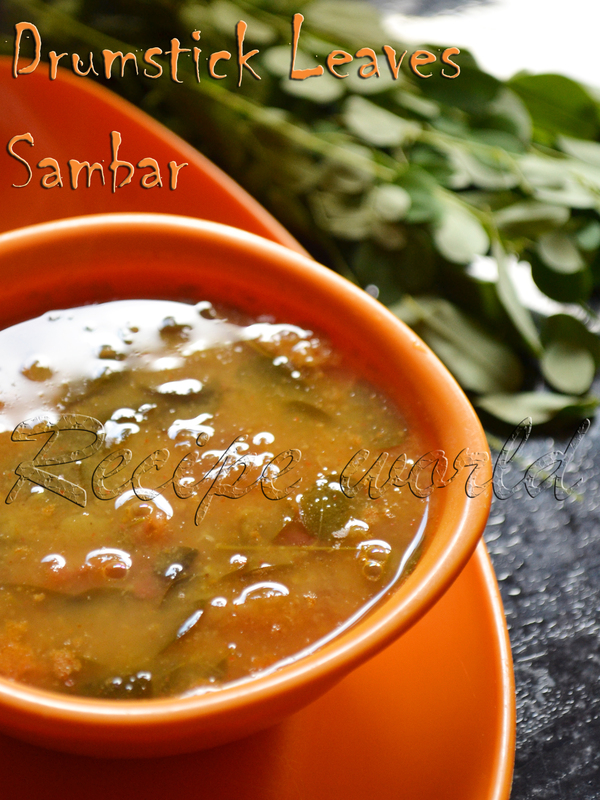 Try out this recipe of Drumstick Leaves Stir Fry and enjoy with hot rice! Separate the drumstick leaves from the stems and wash them thoroughly. Next thing is to prepare the Masala Powder. Roast all the ingredients under the heading Masala Powder except shredded coconut in oil. Powder them coarsely. Finally add the shredded coconut and run the mixie for few seconds to make it a course powder. Heat 3 tbsp of oil in a heavy bottom pan. 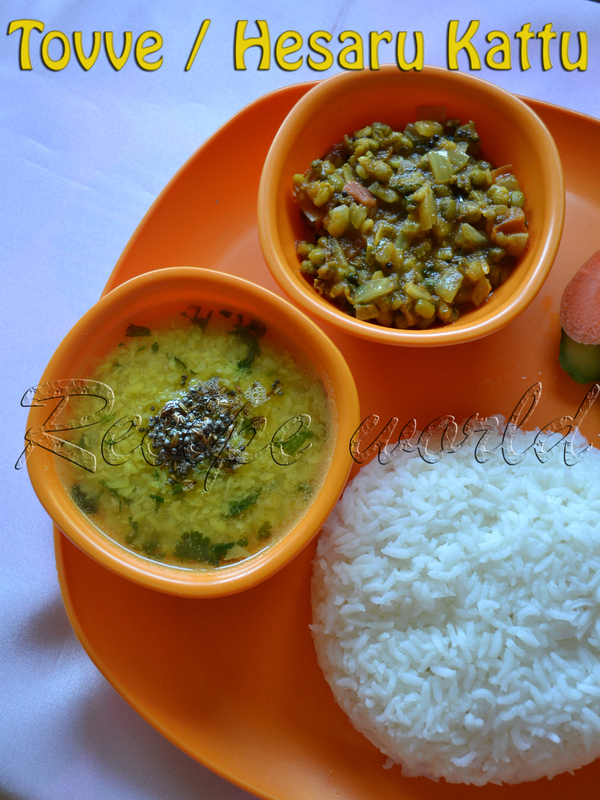 Do the seasoning with urid dal, mustard seeds and pinch of turmeric powder. Addthe drumstick leaves to the seasoning and fry them on low flame for 8 - 10 minutes or till it gets cooked and changes the color. Add the Masala Powder, salt, sugar and amchur powder and mix it well. Cook it on low flame till it gets nicely hot and switch off the flame. 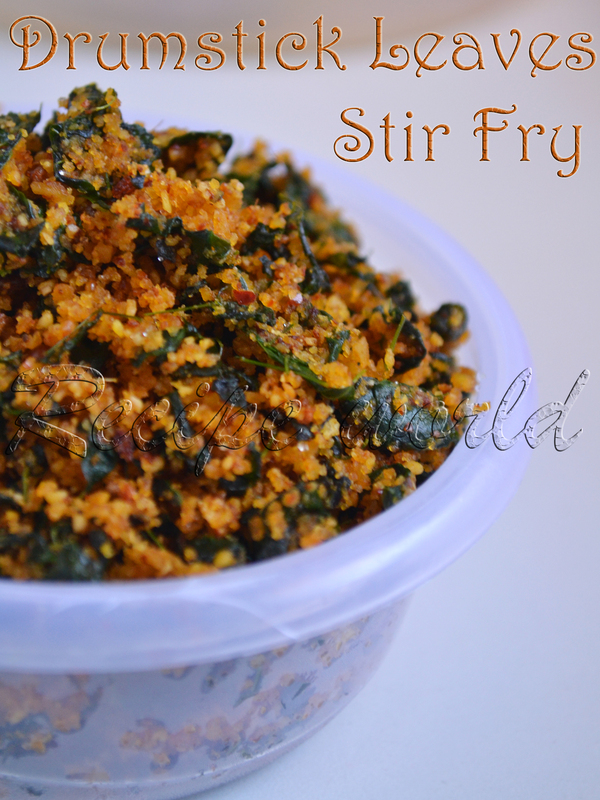 Serve this stir fry as a side dish with Rice or Roti. 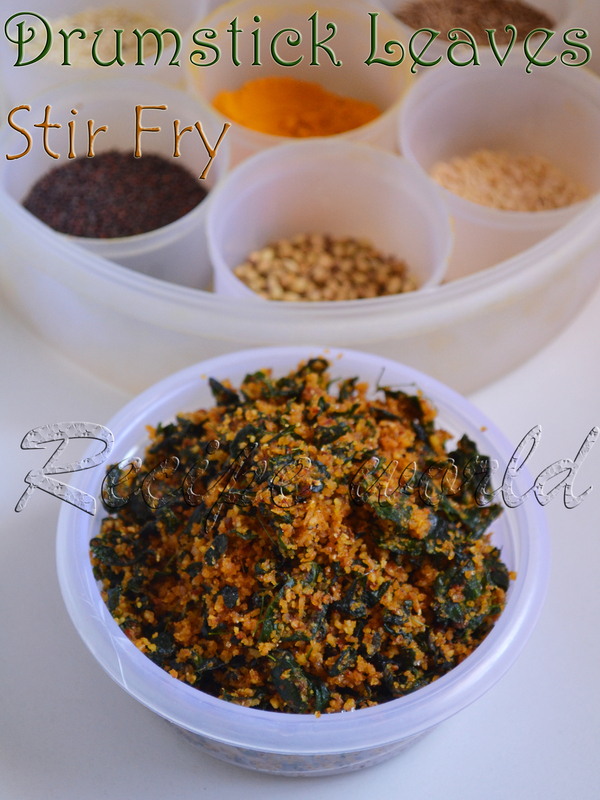 Add chopped onion for this stir fry if you would like to. Add it to the stir fry along with Masala Powder and cook it till the raw smell is gone. You can prepare Capsicum Stir Fry in the same way. Just replace the drumstick leaves with capsicum. I have used shredded coconut for this stir fry. Fresh grated coconut also goes well for this recipe. 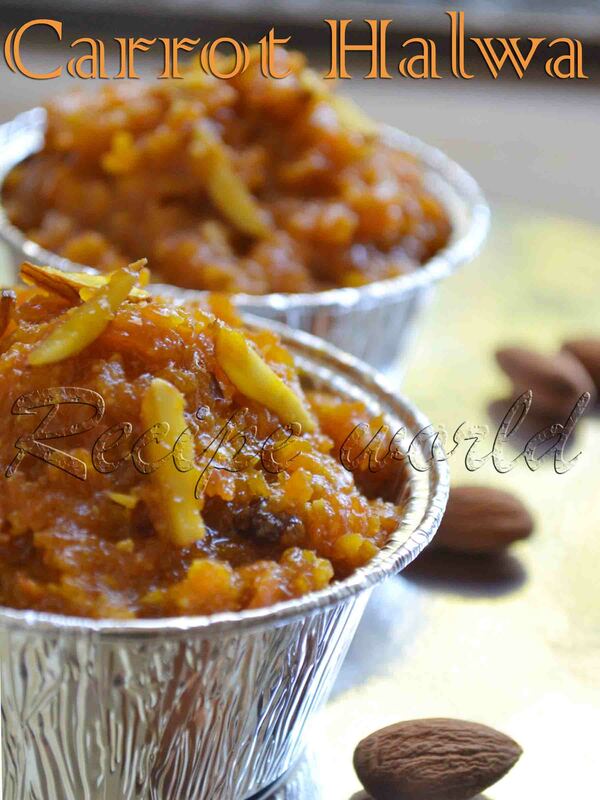 Kesari, Shira or Sheera is a popular sweet dish in South India. 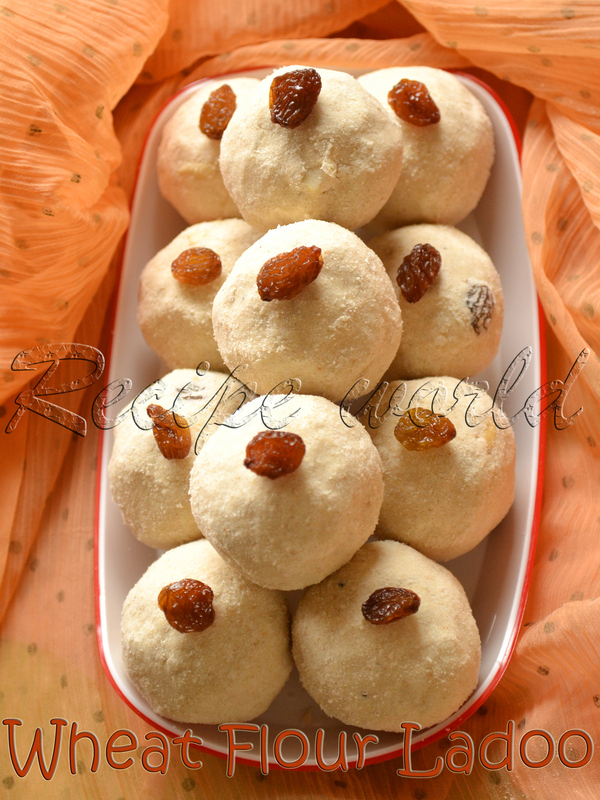 It is one of the most common sweets prepared in festivals, marriages and other occasions. 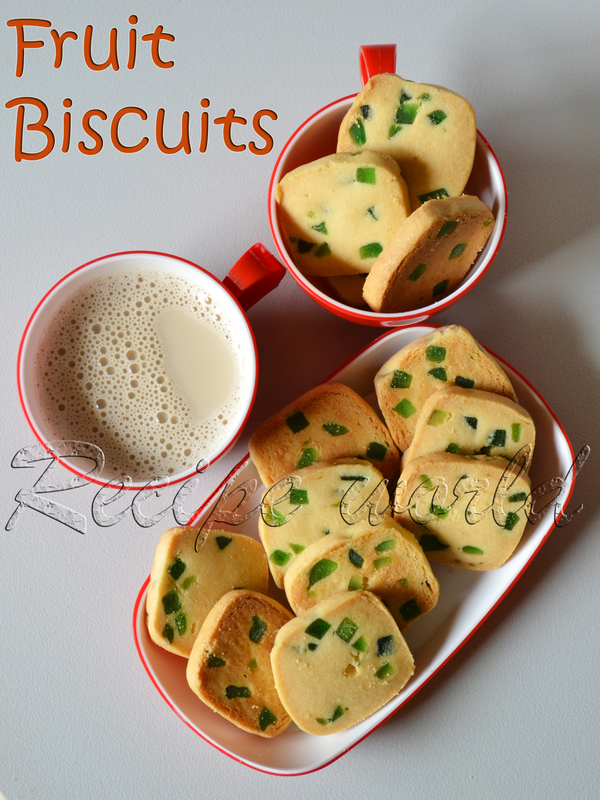 Also, its one of the easy n rich treats for the unexpected guests! 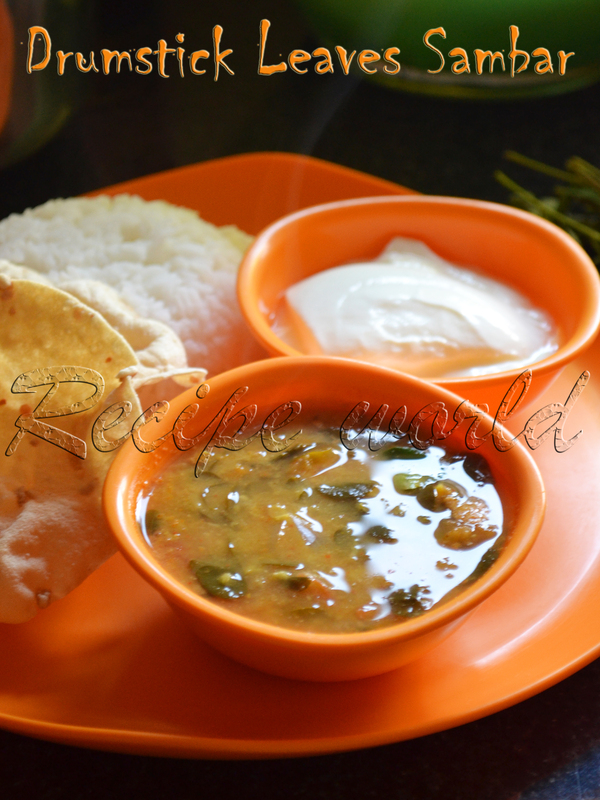 Main ingredient for this dish is Semolina / Sooji Rava. 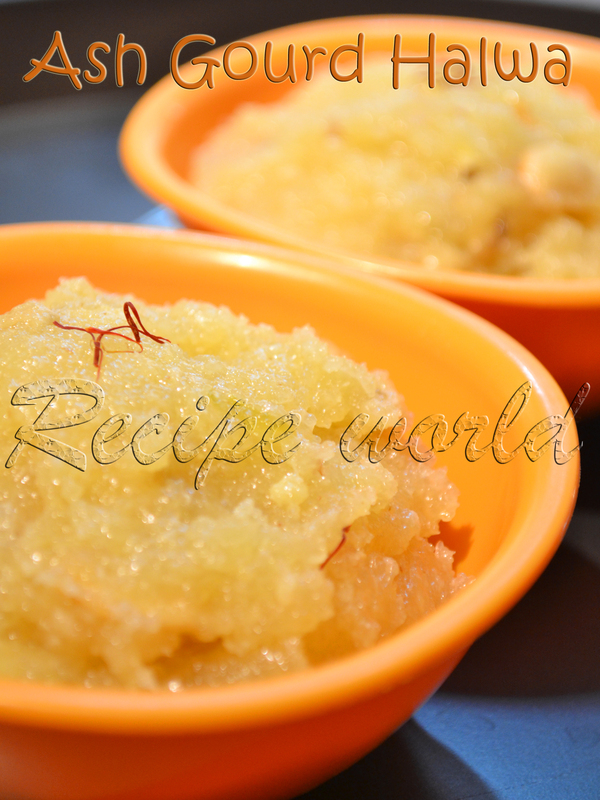 I had posted the Kesari / Shira recipe long back. 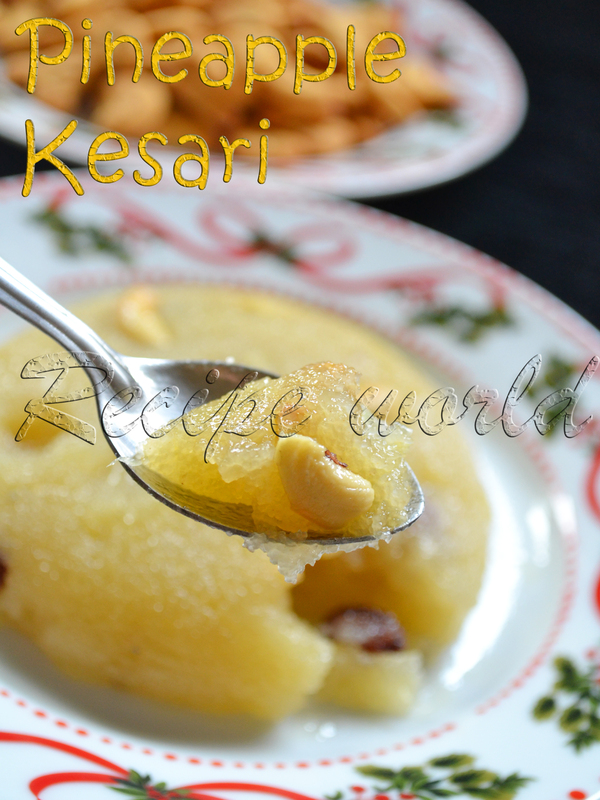 Pineapple Kesari is a variation of that recipe, with added pineapple and of course, more flavorful! Heat the ghee / clarified butter in a heavy bottom pan. Add the semolina and roast it on low flame for 8 - 10 minutes or till you hear a nice aroma of roasted semolina. Meanwhile, bring the water to boil and let it be ready by the time semolina is roasted. Add 2 1/2 cup water and a big pinch of salt to the roasted semolina and mix it nicely. Close the lid and cook it for 7 - 8 minutes. Stir it occasionally. Once all the water is evaporated and the rava is cooked, add 2 cups of sugar. Mix it, close the lid partially and cook for 8 - 10 minutes on low flame. Roast the broken cashews in 1 tsp of ghee. Add it to the Kesari mixture. Finally, add the grated pineapple and mix it well. Cook it for 5 more minutes and turn off the flame. Serve it hot along with some spicy snacks. Kesari and Kharabath / Uppittu is a well known combo! 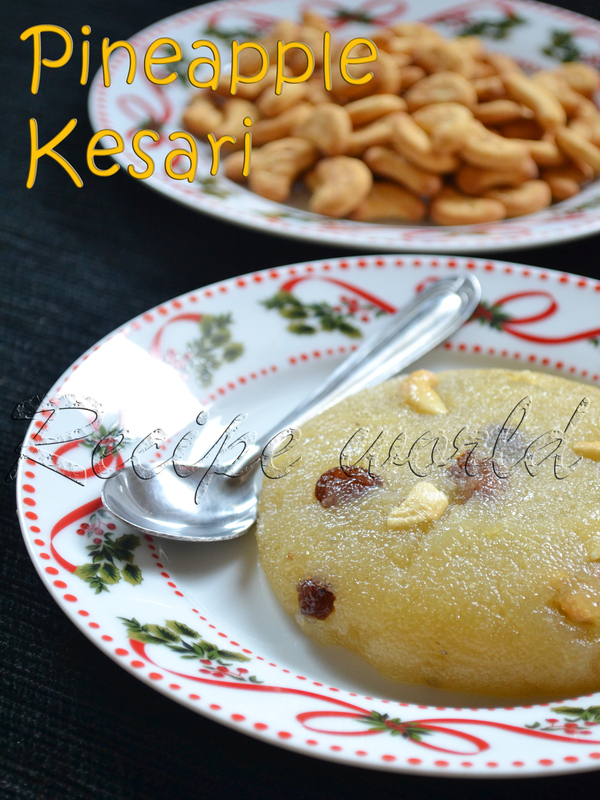 I usually great the pineapple and use it for this Kesari. Alternatively, you can chop the pineapple into small chunks, puree the same and use it for this sweet. Banana is one of those healthy fruits which is commonly available everywhere. This nutritious fruit can be eaten as it is and also can be used in preparing ice-creams, cakes and delicious desserts. 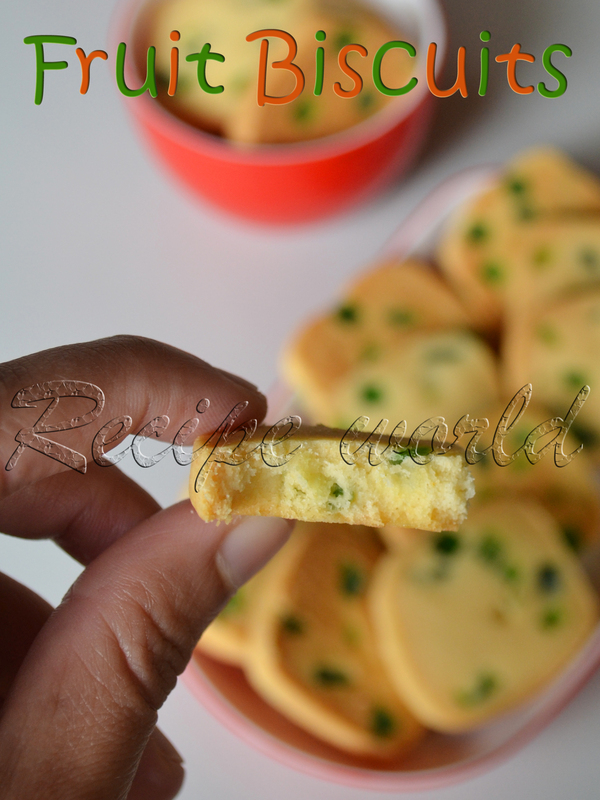 It works as egg re-placer for some cakes and hence, is good for egg-less baking. When I find over ripened bananas in my pantry, either I will prepare Banana Rotti or go for baking something. Over ripened bananas are perfect for preparing cakes and muffins. I had posted Banana Cupcake / Muffins recipe some time back. 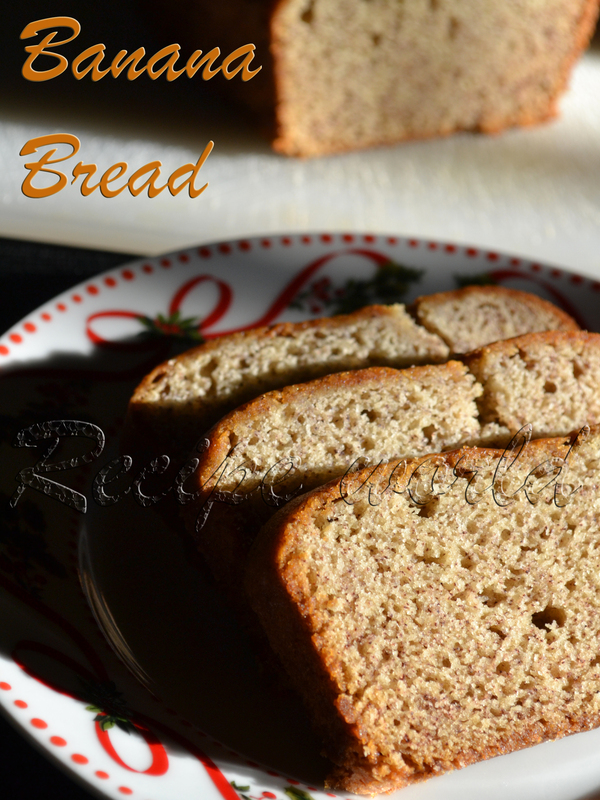 Here is the recipe of perfect Banana Bread..hope you like it! Cut the peeled banana into medium size cubes. Combine sugar and banana pieces in a blender or mixie and prepare the puree. Melt the butter in a bowl and allow to cool. Sieve together all purpose flour, salt and baking soda and keep aside. Take the banana puree in a mixing bowl. Add melted butter, baking powder and vanilla essence. Mix it gently. Fold in the flour mixture little by little and mix it well without lumps. Transfer the batter onto the greased loaf pan and spread it evenly. Bake it for around 45 minutes or till done. Keep an eye on the loaf after baking for 35 minutes. Take the loaf out of the pan before it cools down completely. Put the loaf on a cooling rack to allow proper air circulation. 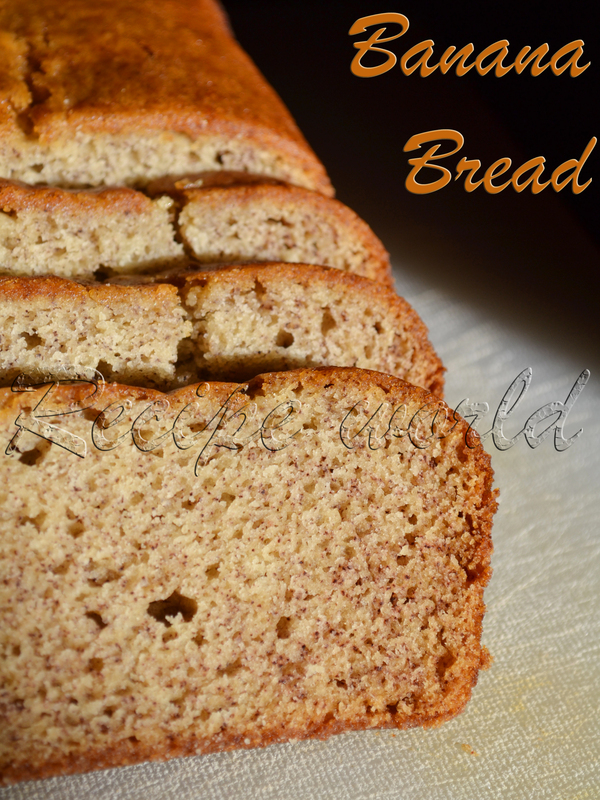 Cut down into slices once it is completely cool and enjoy it with a cup of hot coffee or tea! If you want to avoid using butter, just replace it with cooking oil. 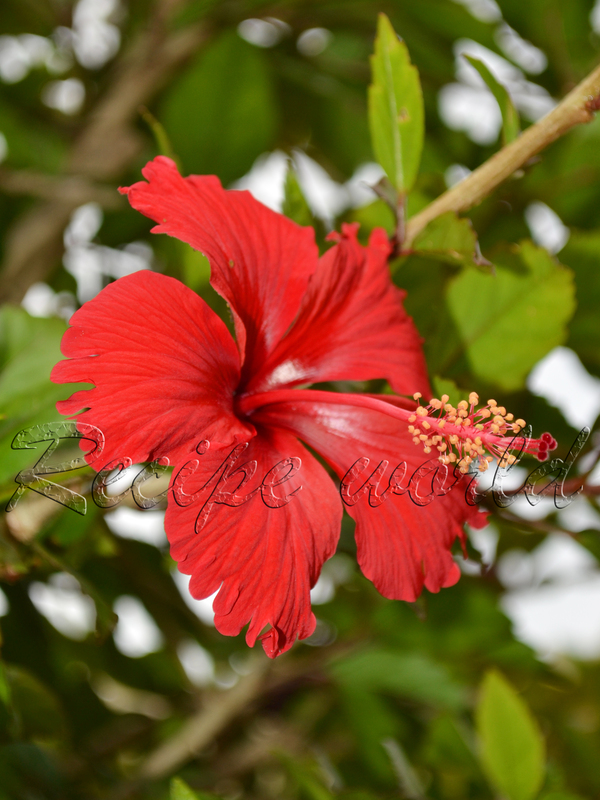 Hibiscus is one of the most common garden plants which is easy to grow and lasts for years. We can find varieties of hibiscus plants everywhere. This plant has got lot of uses. People use hibiscus flowers for offering to God. Hibiscus leaves are good for hair growth and remedy for all hair problems. 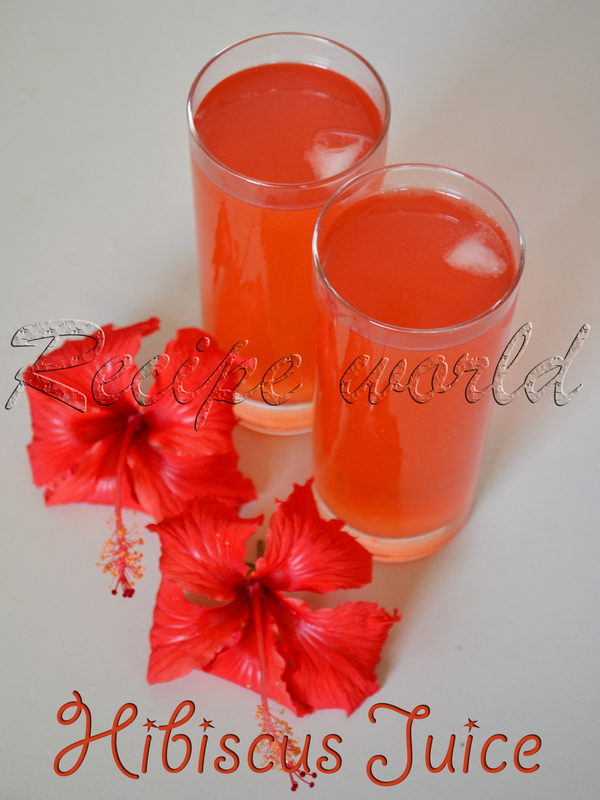 We can prepare Juice and Tea using hibiscus flowers, which is good for health. We had a Hibiscus plant in our backyard. It was full of flowers all the time except during peak winter. We used to pick the flowers daily for offering to God. Kiddo also wanted some flowers for playing and she never missed her share :) Even after picking so many flowers, we could see many flowers still on the plant. These days, I have learned a new recipe using hibiscus flowers. 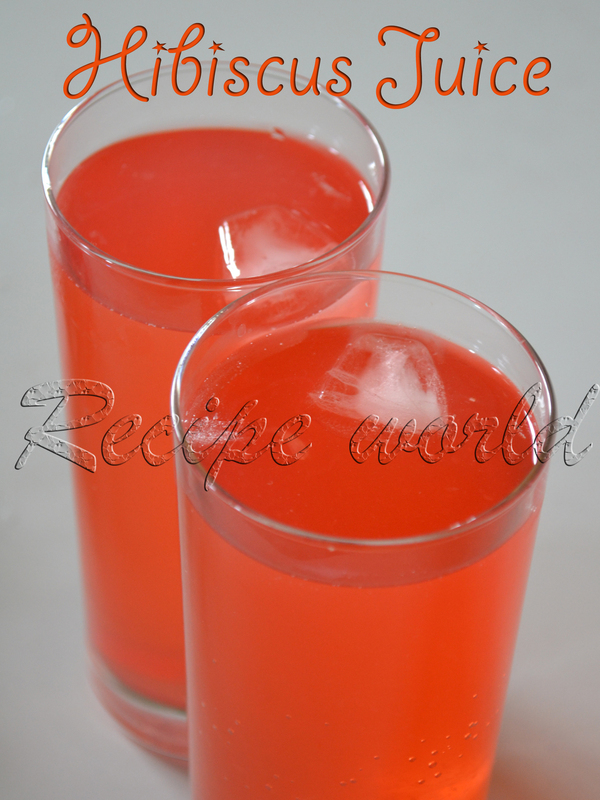 Hibiscus Juice is damn easy to prepare and tastes really yum! I just love that sparkling red color of this juice. Ingredients for this juice are also simple..one can give it a try anytime! Heat water in a vessel. Add the ginger slices and hibiscus petals and boil it for 8 - 10 minutes. Filter the boiled water using a tea strainer. Add sugar and lime juice according to taste. You can see the color of juice changes to sparkling red now. Make it cool before serving. Also, you can refrigerate it or add ice cubes if desired. Ganike Soppu, also known as Kage Soppu in Kannada, is a medicinal plant which is not familiar to many people. Scientific name for this plant is Solanum Nigrum (Black Nightshade). 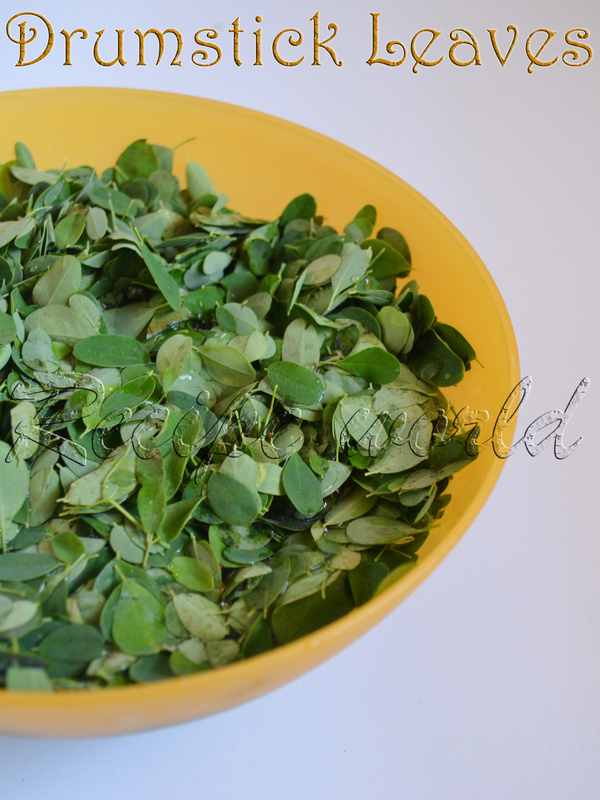 Leaves of this plant are used as a good remedy for cold, cough, mouth ulcer and stomach related problems. Kids love to eat the small, black colored fruits of this plant. I use Ganike soppu as medicine for my daughter whenever she gets cold. I will crush the leaves with little water, collect about 2 table spoons of extract, then mix it with sugar / jaggery and make her drink. This works really well for her. I have few Ganike Soppu plants in my backyard just for kiddo. She loves to pick and eat those small berries from these plants daily! Few days back, I was talking to Mom something about my plants. She told me that delicious Chutney can be prepared using Ganike leaves. I just tried her recipe and it tasted really well. Its so easy to prepare and also good for health. 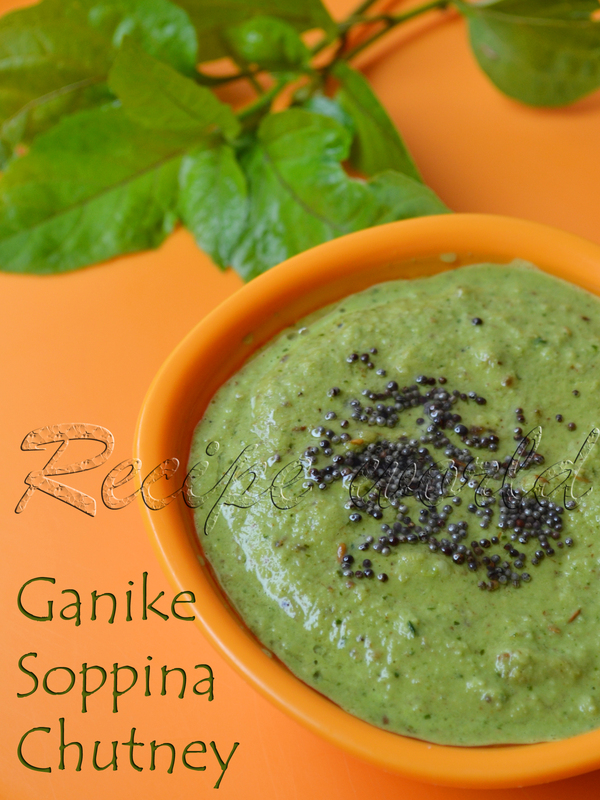 Sharing the Ganike Soppina Chutney with you now..hope you like it! Heat 1 1/2 tsp of oil in a heavy bottom pan. Add cumin seeds and sesame seeds and roast them till nice aroma comes. Then add the cleaned Ganike leaves. Saute them for 1 - 2 minutes till it changes the color and switch off the flame. 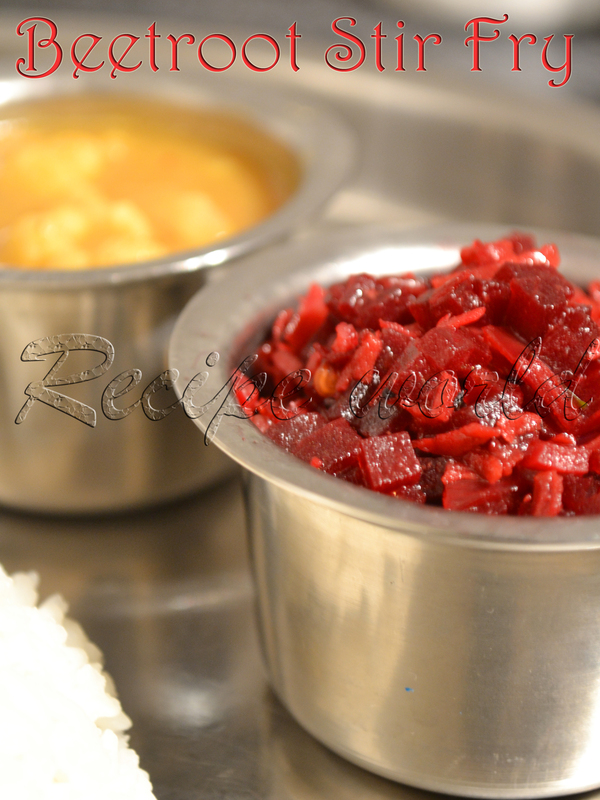 Grind together the roasted ingredients along with grated coconut, tamarind and salt to taste into fine paste. Add water as required. Heat oil in a heavy pan. Add mustard seeds and when they start crackling, switch off the flame. Add this seasoning to the ground paste. Delicious Chutney is ready now. Serve it as a side dish with rice. Instead of 2 green chillies, 2 red chillies and 1 green chilli can be used here. 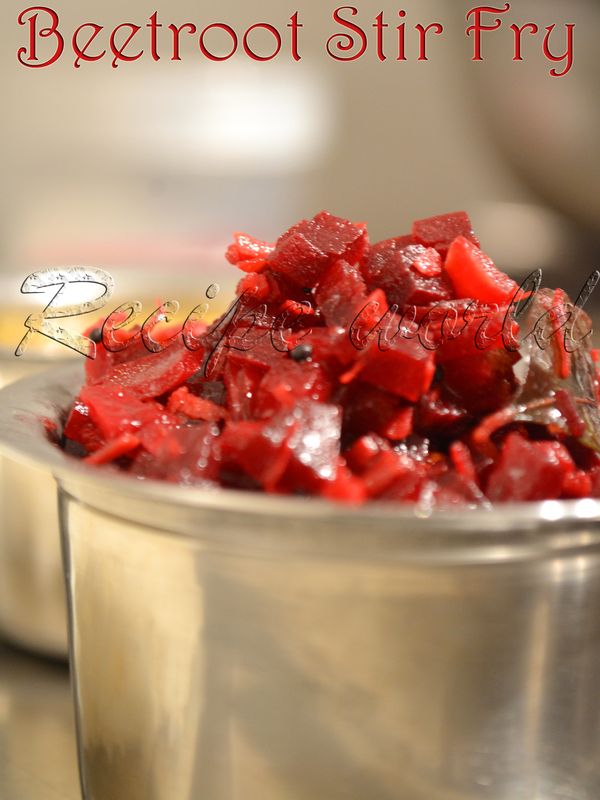 If you don't want to preserve it in the refrigerator, heat the Chutney nicely and it will be good for few more hours. Khoa or Khoya, also called as Mawa, is a product of milk which is widely used in Indian cuisine. This is prepared by boiling the milk till it gets thick. 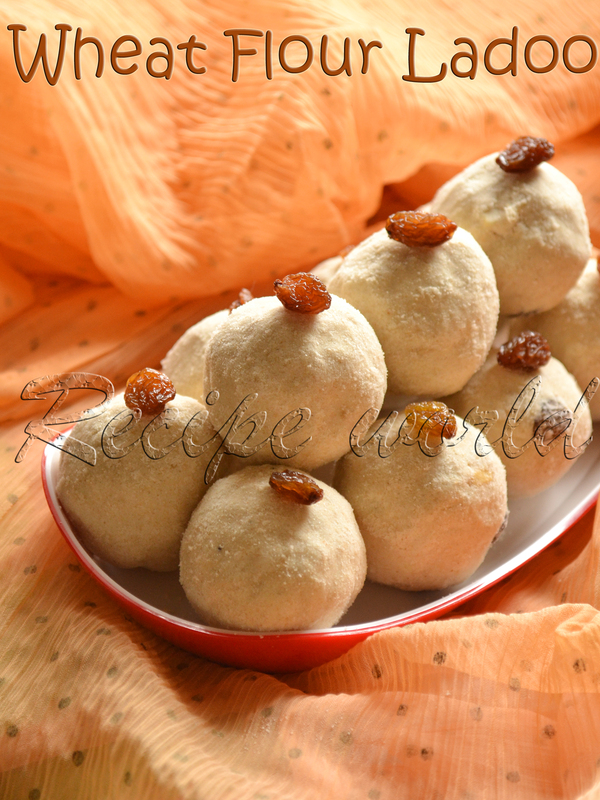 For preparing Indian sweets like Halwa, Barfi, Pedha, Gulab Jamoon, etc., Khoa is used to make them rich in taste. In India, Khoya is easily available in most of the supermarkets and grocery stores. When I was in Bangalore, I always used the store bought Khoa for my sweets. I had tried preparing Khoa at home sometime back and it was really good. These days, I am making Khoya at home whenever needed. Preparing Khoa at home is not at all difficult. The only thing is it takes lot of time to prepare. 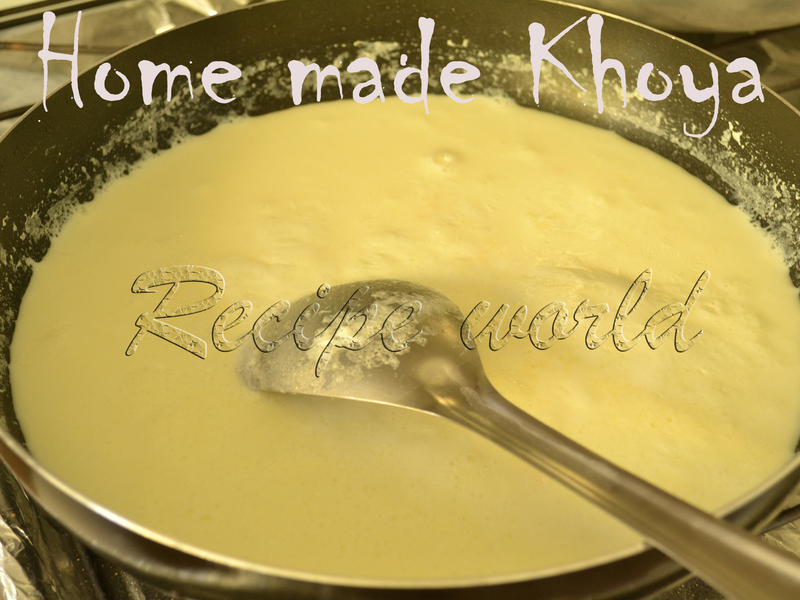 Here is the recipe to prepare your Khoa at home.. Transfer the milk into a wide pan with thick bottom and bring to boil. I prefer using non-stick pan to avoid milk sticking to the bottom. Keep stirring the milk with a spatula occasionally. Slowly, the water content in the milk gets evaporated and milk starts thickening. Keep stirring the mixture, and when it starts leaving the bottom of the pan and comes to ball stage, its time to turn off the flame. Once it cools down completely, knead the Khoa nicely. Transfer to an airtight container and store it in the refrigerator. Use when required. 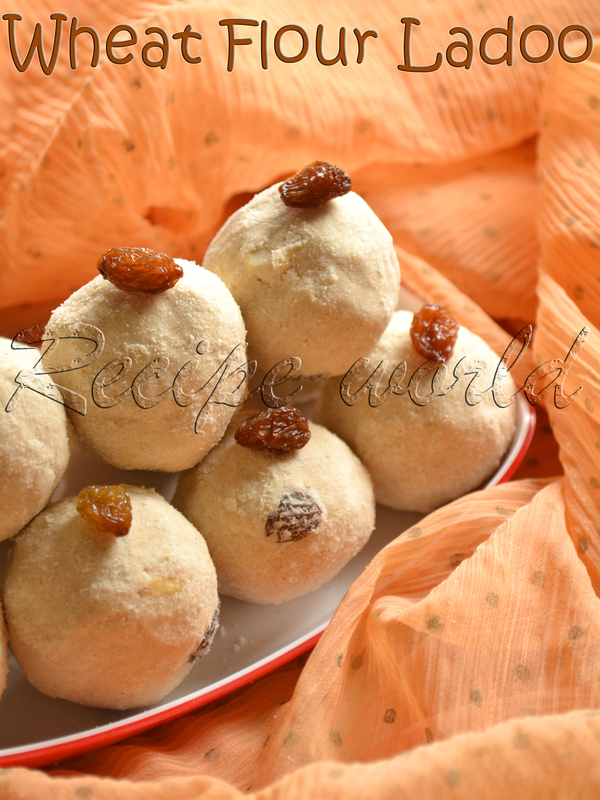 Khoa gives a richer taste to Indian sweets like Barfi, Halwa, Gulab Jamoon, Pedha, etc. When its summer, something cold would be perfect to have when we feel thirsty. I prepare varieties of milkshakes, juices, smoothies, Lassi, etc. healthy n refreshing drinks at home using fresh ingredients. 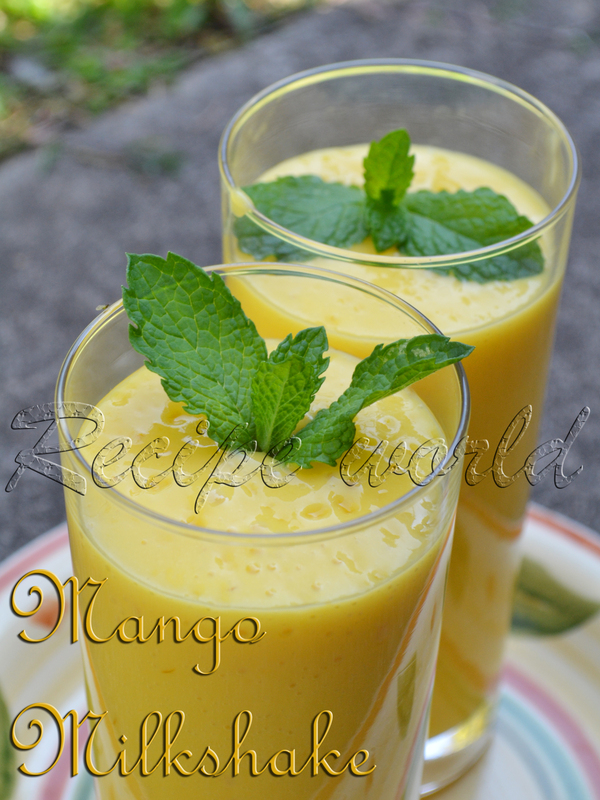 Since its the mango season now, we all love to have mango milkshake and juice whenever mangoes are there at home. 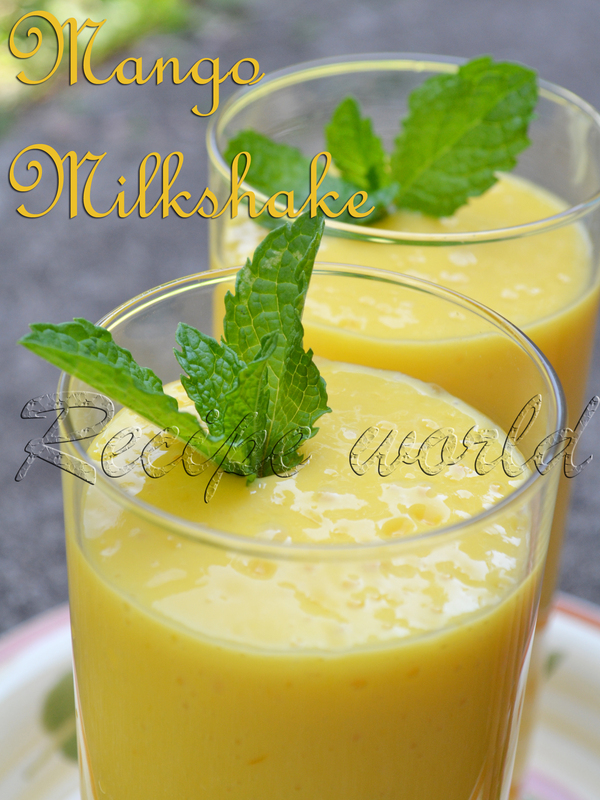 Mango Milkshake is my daughter's all time favorite. She will be happy to have this drink anytime! Try this easy and delicious milkshake and let me know how you liked it! Peel and chop the mangoes roughly into medium size cubes. Blend the mango pieces along with sugar and pinch of salt into fine paste. Add little milk if required. Once it becomes a fine paste, add the remaining milk and water and adjust the consistency. Blend it for one more minute so that everything is combined well. Check and adjust the taste. You can reduce the quantity of milk by adding more water. If the milkshake need to be served immediately, use the chilled milk for preparing it!